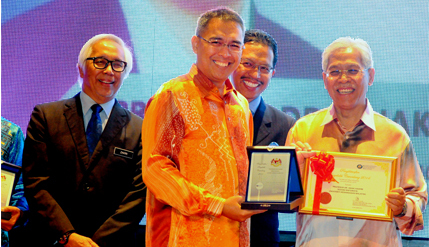 PUTRAJAYA, 9 October 2014 – Chairman of The School of Mathematical Sciences of The National University of Malaysia (UKM), Prof Dr Ishak Hashim has been given the 2014 Outstanding Research Award by the Ministry of Education. Dr Ishak who is a Prof of Fluid Dynamics & Numerical Methods was chosen as a leading international researcher when he was ranked as among the top one percent of the world’s greatest researchers by Thomson-Reuters. Prof Ishak specialises in the field of Fluid Mechanics, Numerical Methods and Mathematical Modelling which are branches of Applied Mathematics. He was among the four Malaysian academics who received the honours presented by Second Education Minister, Datuk Seri Idris Jusoh. The other three are Prof Dr Abdul Latif Ahmad and Prof Dr Bassim H. Hameed both from USM in chemical engineering and Prof Dr Saidur Rahman Abdul Hakim from the University of Malaya (UM) in social sciences. Datuk Seri Idris when presenting the awards said the recognition is based on the results of their studies which were often cited as references after their publication in high impact scientific journals tracked by Thomson-Reuters. He had also awarded grants to the Malaysia Laboratories for Academia-Business Collaboration (MyLab) and presented certificates to the Higher Institution Centre of Excellence programme (HICoe). Idris said “Thomson Reuters in its report, The World Most Influential Minds 2014 have indicated that the four academics given recognition had their published articles being among the most cited as reference by researchers around the world. “Thus the achievement of the four academics in the field of science helped propel the Malaysian universities in world rankings,” he said. Among those present at the ceremony were UKM Vice-Chancellor Prof Datuk Dr Noor Azlan Ghazali, Deputy Vice-Chancellor (Research and Innovation) Prof Datuk Dr Mazlin Mokhtar and Director of the Institute of Microengineering and Nanoelectronics (IMEN) Prof Datuk Dr Burhanuddin Yeop Majlis. In a related development IMEN was selected as a Centre of Excellence in Higher Education (HICoE) recognised by the Ministry of Education. In conjunction with the award, Microelectromechanical systems (MEMS) for Biomedical has been chosen as a niche area of HICoE. An additional research fund of RM9 million will be provided by the ministry for 3 years from 2014 to 2016 to carry out further research by MEMS on the development of an artificial kidney. At a press conference later, Idris said Malaysia registered a 310% increase in the publication of papers by its researchers in a number of high-impact publications between 2007 and 2012 considered as among the highest in the world. “This is a result of the government’s continuing efforts to promote research and development (R&D) in this country,” he said. R&D, he said, has a considerable role, especially in innovation and inventions for the benefit of humankind and to bring prosperity to the people and the country. He also pledged MyLAB grants of RM17 million to local research universities in the four core fields of nanotechnology, biotechnology, automotive and aerospace engineering.